British Falcon Squadron, Royal Tank Regiment, at Winterbourne Gunner, southern England, conducting final preparation and training before deploying in support of the civil authorities in Salisbury city centre, Friday March 9, 2018. British police asked the military on Friday to help investigate the nerve-agent poisoning of a former spy, as investigators' attention increasingly focused on the victim's house in a quiet suburban street. (Cpl Pete Brown/Ministry of Defence via AP). 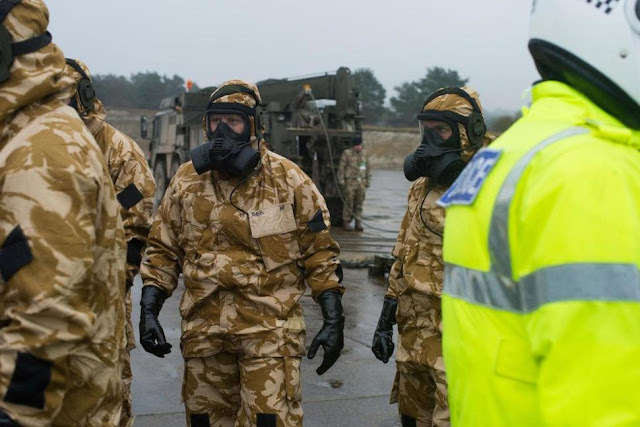 Dozens of khaki-clad troops from British Royal Falcon Squadron trained in chemical warfare were deployed on the streets of the usually sleepy English city of Salisbury on Friday as part of the investigation into the nerve-agent poisoning of a former Russian spy and his daughter. The sight of the soldiers, and forensic experts in bright yellow hazmat suits, added to the increasingly surreal scenes in a city best known for its towering medieval cathedral and its proximity to the ancient Stonehenge monument. Sergei Skripal and his daughter Yulia, 33, were found unconscious on a bench near the River Avon in the city on Sunday. They remained in critical condition in a local hospital Friday, poisoned with what authorities say is a rare nerve agent. A police officer who helped investigate was in serious condition, and a total of 21 people have received medical treatment. Skripal, a former Russian military intelligence officer, was convicted in 2006 of spying for Britain and released by Moscow in 2010 as part of a spy swap. The 66-year-old former agent had been living quietly in Salisbury, 90 miles (140 kilometers) southwest of London. Counterterrorism detectives are leading a vast investigation. One line of inquiry is whether the pair were poisoned at Skripal's modest suburban house before going out for Sunday lunch and a visit to a pub. On Friday, police called in about 180 marines, soldiers and air force personnel with expertise in chemical weapons, decontamination and logistics to help with the probe and to remove vehicles that might be contaminated. Military vehicles arrived at Salisbury District Hospital, where the victims are being treated, to take away a police car. Authorities say there is no risk to the general public from the attack. Unlike radioactive poisons, nerve agents dissipate quickly. Detectives were retracing the Skripals' movements as they try to discover how the toxin was administered and where it was manufactured. Authorities cordoned off Skripal's house, a car, a restaurant, a pub and the cemetery where Skripal's wife, Lyudmila, is buried and where there is also a memorial headstone for his son, Alexander. Lyudmila Skripal died of cancer in 2012. Alexander died last year at the age of 43. The cause is unclear: some reports say he died in a car accident while on holiday in Russia, others that he died of liver failure.At the graveyard, forensic officers in protective gear could be seen erecting a blue tent on Friday. Former London police chief Ian Blair said Friday that the police officer who is seriously ill had visited Skripal's house — suggesting the nerve agent may have been delivered there. Blair told BBC radio that Detective Sgt. Nick Bailey had "actually been to the house, whereas there is a doctor who looked after the patients in the open who hasn't been affected at all. There may be some clues floating around in here." Highly toxic and banned in almost all countries, nerve agents require expertise to manufacture — leading some to suspect whoever poisoned Skripal had the backing of a state. "A well-equipped lab and a very experienced analytical chemist can do it, but it's not the sort of thing a chancer doing kitchen-sink chemistry can get away with," chemical weapons expert Richard Guthrie said.Russian Foreign Minister Sergey Lavrov said Moscow might be willing to help with the investigation but expressed resentment at suggestions the Kremlin was behind the attack. 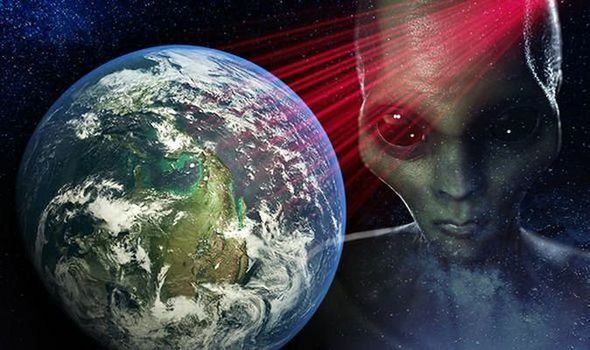 "We're accused not only of this, but we are accused of everything that goes wrong on this planet, according to our Western partners," Lavrov said. "If anyone's interested in our assistance with the investigation, whether it be on the poisoning of some subjects of the United Kingdom, or rumors on the interference in the affairs of the United States during the election campaign, or anything else. . If you really need help from Russia, then we will be ready to consider such a possibility, if we do have relevant data," he said, speaking in Addis Ababa, Ethiopia. The U.K. has vowed to take strong action against whoever was responsible for the "brazen and reckless" attack. British authorities say it's too soon to lay blame, but suspicions have fallen on Russia. Those branded enemies of the Russian state have sometimes died mysteriously abroad, and the Skripal case echoes the death of Alexander Litvinenko, a former Russian agent who was poisoned in London in 2006 with radioactive polonium-210.A British inquiry found that Russia was responsible for Litvinenko's killing, and that Russian President Vladimir Putin probably approved it. Blair, the former London police chief, called for a review of the deaths of 14 Russians in the U.K. amid suggestions they were targeted by the Russian state. A BuzzFeed News investigation claimed U.S. spy agencies have linked the 14 deaths to Russia, but U.K. police shut down the cases. Russian media have mocked suggestions that Moscow was involved in the Skripal attack — but also noted that those who betray Russia seem to come to a bad end. One anchorman on a state television news show began a report on Skripal's poisoning with a warning to anyone considering becoming a double agent. "Alcoholism, drug addiction, stress and depression are inevitable professional illnesses of a traitor, resulting in heart attacks and even suicide," Channel One anchorman Kirill Kleimenov said in the Wednesday broadcast. Associated Press writers Danica Kirka in London and Jim Heintz in Moscow contributed to this report.